Upendra Bhanja's iconic Odissi lyric, but in a lesser-known Todi tune. 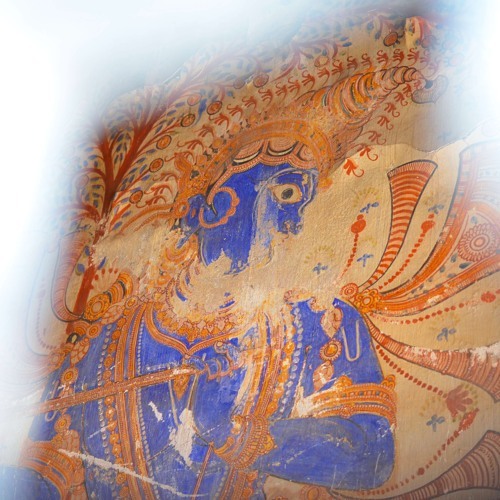 Image : Medieval mural at Bada Odia Matha, Puri. Both Bhairabi (ଭୈରବୀ) and Todi (ତୋଡ଼ି) names are now used interchangeably in Odissi and it seems like the ancient versions have converged into one rāga. Both have the same scale but some typical movements in this song cause me to lean towards calling it Todi. Even in the past, they had probably the same scale but different nyāsa swaras. They usually employ both variants of rishabha and very rarely the tivra madhyama. My movements, as far as I can trace, derive significantly from old gramophone recordings and traditional artforms like Prahallada Nataka & Bharata Lila.